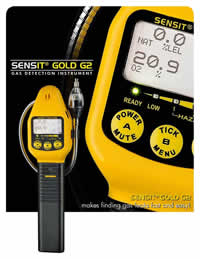 The SENSIT® GOLD G2 is the most versatile and user-friendly SENSIT hand-held gas detector available. The “G2” can be configured for combustible gas readings in PPM, LEL, and /or percent volume, as well as a variety of toxic sensors and oxygen. The SENSIT® GOLD G2 is ideal for leak location and confined space applications.